Jesus told 57 parables as related in the four gospels. What is a parable? It is an earthly story that relates a spiritual truth. We live in a society that loves top ten lists. If we put together a list of Jesus’ greatest hits when it comes to parables, there is no doubt which one is #1: the Prodigal Son. You’ll find it in Luke 15:11. You probably know the story. If you don’t, it’s worth reading. It’s a drama with three characters: a younger son, a Father, and an older son. Which character speaks to you? Is it the headstrong younger son who demanded his inheritance now, who left home with his pockets filled with his Dad’s money who promptly squandered it on high living and loose women and eventually slinked home in disgrace? Is it the dutiful but self-righteous older brother who resents his Father’s celebratory homecoming for his wayward brother? Is it the sad Father who loves his sons without condition and could forgive his son’s licentiousness without a second thought? Most people see a little (or a lot) of each brother in themselves. Some relate to the Father’s anguish at losing his son and the joy he feels when he returns. Most people love beauty. This story reveals the exquisite beauty of unconditional love in the words of a master story teller: Jesus. So what is the spiritual truth He is trying to convey to us? That God loves us. That He is looking for us. That He will come running for us in our need. The Father in this story is truly our Father. No one has explored the beauty of this story with more insight than Father John Riccardo. Take six minutes to watch this video. You’ll be glad you did. 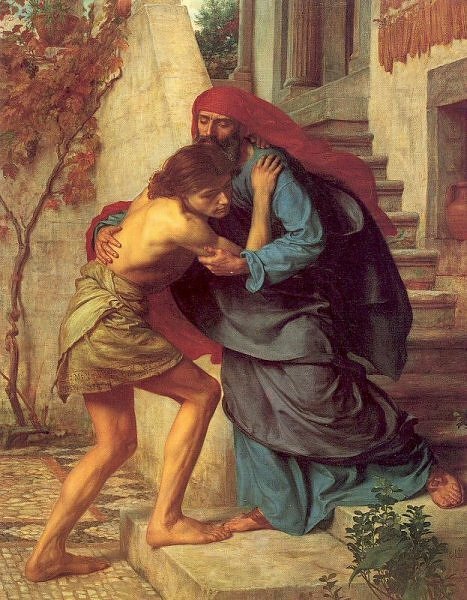 The parable of the Prodigal son teaches us that God will never leave us nor forsake us though we stray, reject, and follow others; he is faithful to receive us and forgive us and restore us to our rightful place with him. And the eldest brother with envy in his heart thought his younger brother didn’t deserve the Father’s love. But Jesus said, to him that much is forgiven-loves much. I followed the prodigal son link to the prayer for “the Church.” Which church? I, though not a Roman Catholic, I confess every Sunday that I believe in the holy catholic church. Sounds like this outfit is one of those success churches, a group formed to give a religious tinge to the holy Free Market. What an idol! What a form of paganism disguised as something wonderful to true believers like Sophia and Bednadette who exprress themselves with such eloquence. What I love is the nun bus, spreading the truth about whom the Ryan budget will really hurt.